What image does that conjure in your head? Mmmmm. Yum, yum, yummy! Or ick, uck, gleck, blech, blech, blech, dear-Lord-in-heaven, are you kidding me? Well, to be totally honest, up until a few years ago, it was the latter for me. Just the idea of brussel sprouts made me want to hurl. And I don’t hurl easily, let me tell ya. But, being the intrepid food taster that I am, I sucked it up and tried one. Just to say I did. Why didn’t anybody tell me that brussel sprouts are actually amazing when cooked correctly? I mean seriously awesome. I had to make them at home. I looked up how to cook them, and the overwhelming recommendation was to roast them. Easy, peasy. Just clean them up. Cut them in half. Coat with olive oil, salt and pepper. Pop in the oven for 20 minutes. Yum, yum, yum. 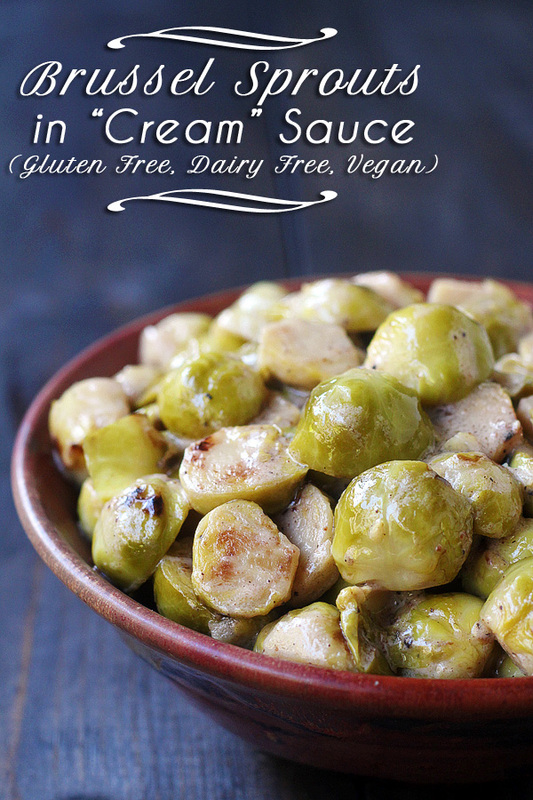 But then we kept going to my in-law’s place when my step mother-in-law would make brussel sprouts in cream sauce. They were so good. I kept quizzing her on what she was doing, but as you have learned in this post and this post, she doesn’t measure or do recipes. I have now spent months trying to recreate what she makes, and I finally did it. 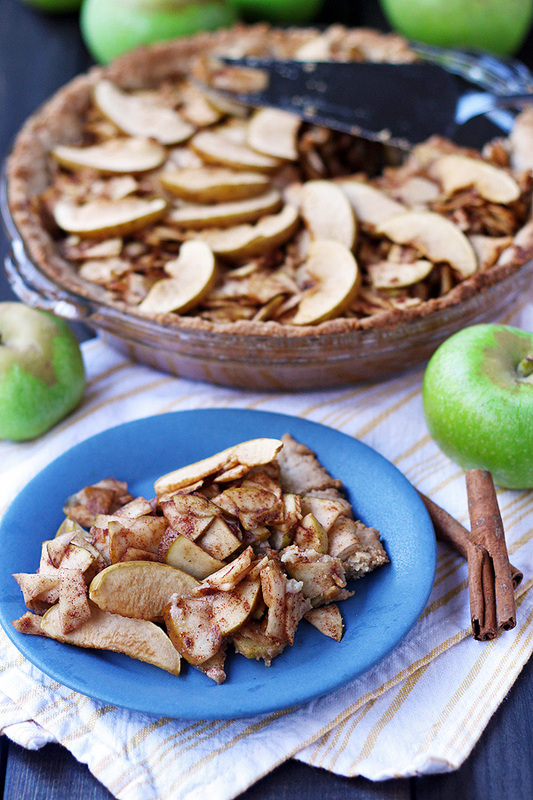 It is so exciting because now I get to share this fabulous recipe with you. 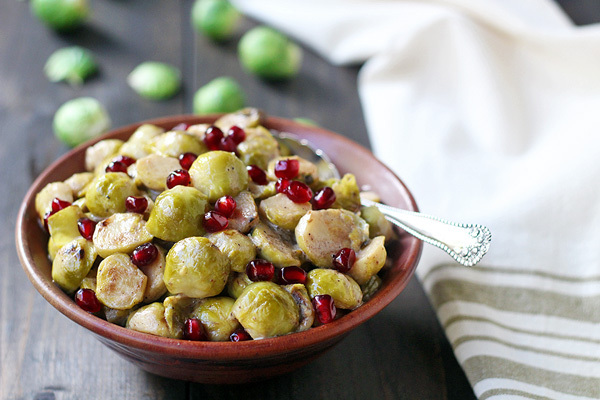 And you get to make this awesome brussel sprouts recipe for yourself. Trust me on this one. You will be so happy you made this. So much so that you will be very disappointed when you eat the last one on your plate. You might notice a couple of things in the pictures. There are pomegranate seeds in some pictures. They are not in the recipe below and are not required for this dish. You can add them for a nice little twist, but I just thought they looked pretty. Also, you might notice there isn’t a thick, heavy cream sauce in the picture. 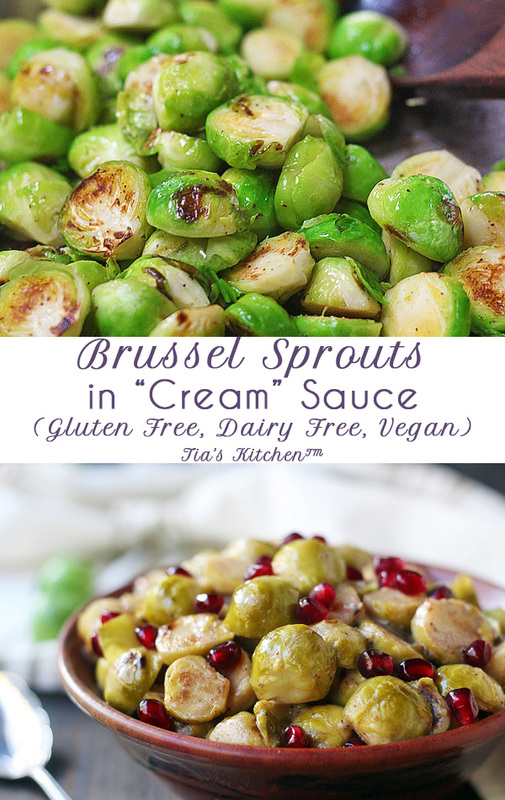 That’s because it is a nice light cream sauce that just barely clings to the brussel sprouts. And it’s just perfect that way. This recipe is so easy. Great to make when you want to impress or just enjoy some nice comfort food. 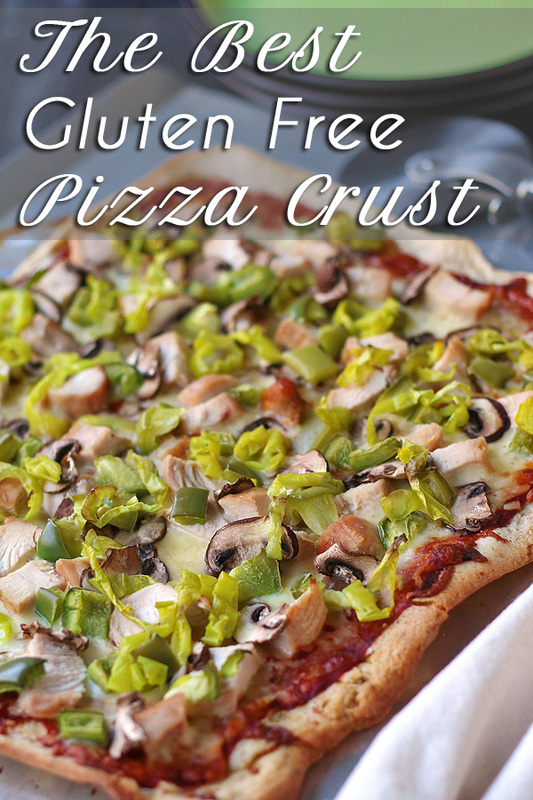 Linking this to Gluten-Free Wednesdays (GFW), the weekly blog carnival that Linda of The Gluten-Free Homemaker, Cassidy of Cassidy’s Craveable Creations and Lynn of Lynn’s Kitchen Adventures host. 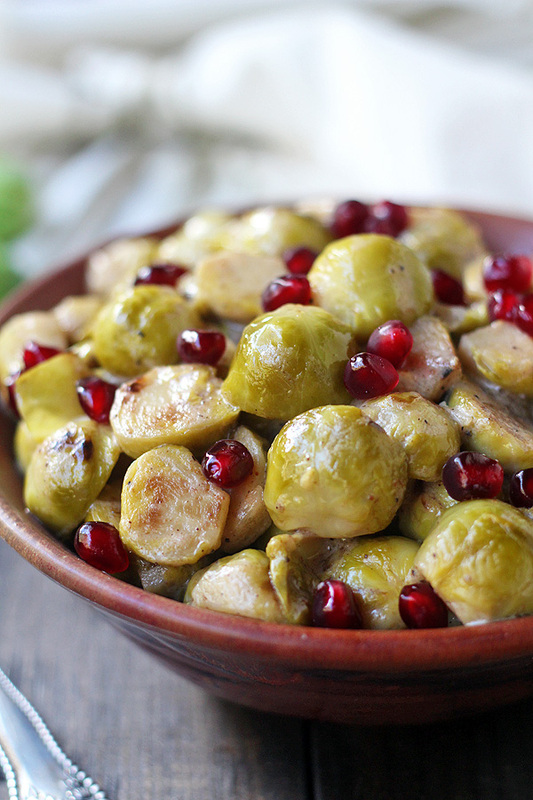 Cut end off brussel sprouts. Remove and discard icky outer leaves. Cut brussel sprouts in half. Melt non-dairy spread in saute pan on medium high heat. Add brussels sprouts. Add salt and pepper. Cook while stirring occasionally until brussel sprouts are starting to caramelize. When they have gotten some nice color, turn down the heat to medium low. 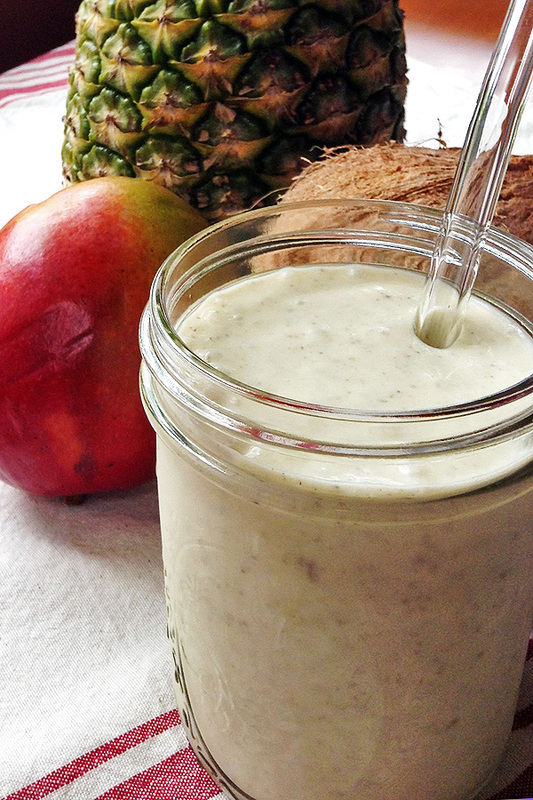 Add coconut cream, nutmeg and lemon juice. Stir and cover. Check after 15-20 minutes to see if done by poking the base of a brussel sprout with a fork. When it is soft they are done. Add pomegranate seeds on top (optional). I had the same experience! 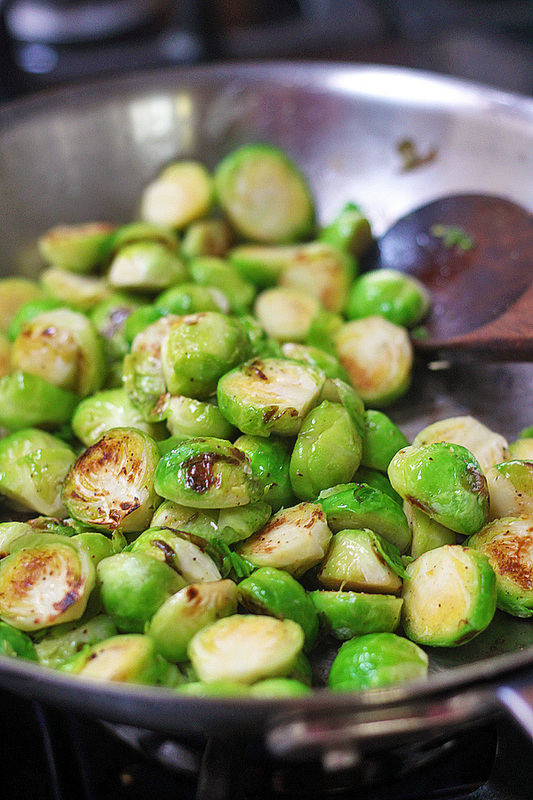 I HATED the Brussels sprouts I was served, i.e., (forced to eat), as a kid. Then, one day a few years ago, I discovered roasted Brussels sprouts!!! And I was knocked off my socks!! 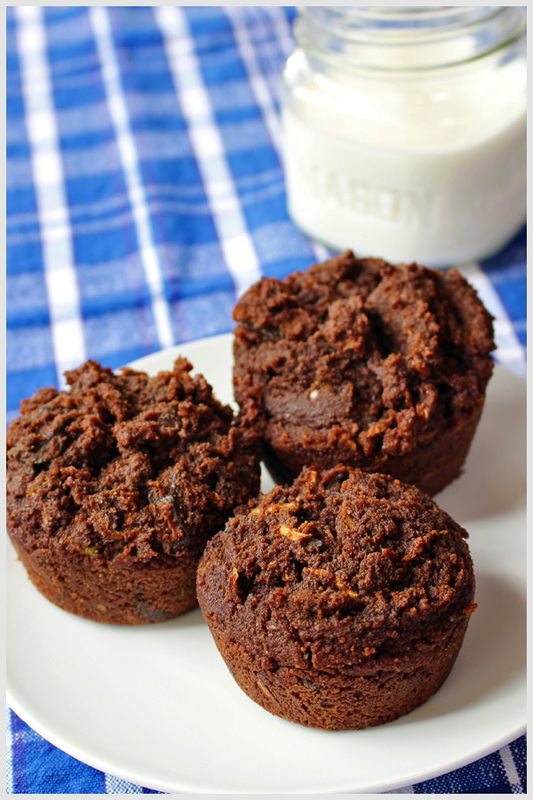 I have pinned your recipe to try in the not so distant future!! With cream they must be heavenly!! Thanks for sharing! Did you put cranberries on it for the picture? You don’t say. Those are pomegranate seeds. I had some around, and I thought they looked nice in the pictures. You can add them or not add them. The dish tastes great either way. Sorry I wasn’t more clear. It’s just a quick sentence in the middle of the post. Tia, this looks absolutely delicious! 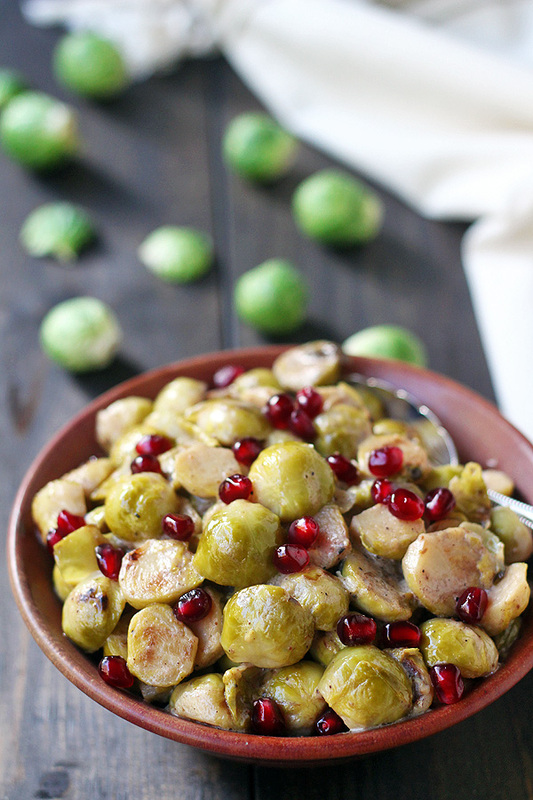 Brussles sprouts are my absolute favorite lately — now I’ll have to try them out your way too 🙂 Thank you for the recipe! These do look amazing! 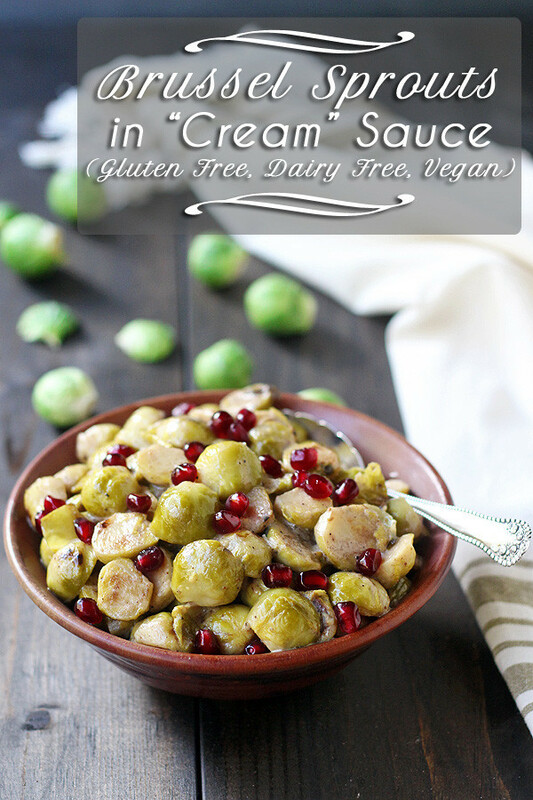 I’m the only brussel sprout lover in our house, but that’s okay, it just means I get more to myself!